Onyx Picassos are Perculas that have both extra black coloration, and exaggerated Picasso barring. Like all clownfishes, Amphiprion percula is a sequential hermaphrodite. The largest individual present will exert dominance and become reproductively female. The next largest fish will become reproductively male. The female may not tolerate other smaller individuals. Usually ignores reef invertebrates and corals. 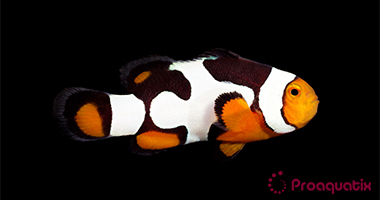 Clownfishes sometimes adopt various corals and algae as substitutes for host anemones. Proaquatix specimens have been weaned to take aquarium pellets and flakes. Freshly frozen invertebrates such as ocean plankton, Mysis shrimp, brine shrimp, and chopped squid.